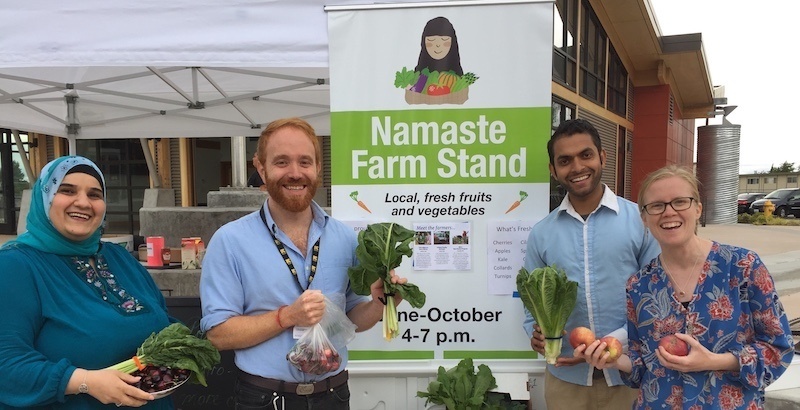 We are thrilled to announce that Namaste Farm Stand has been authorized to accept EBT benefits and Fresh Bucks coupons! People have been asking to use EBT benefits at the farm stand since our grand opening. We knew it was a need; our community survey results showed people would use their EBT benefits at the farm stands, and SeaTac and Tukwila has some of the highest SNAP participation rates in King County. Tukwila has the highest rate among seniors 65 and older – 30 percent use SNAP benefits compared to the countywide average of 12 percent. Starting at our Tukwila location on Aug. 15, and in SeaTac later this month (stay tuned for the exact date), community members will be able to purchase fresh fruits, vegetables and herbs from the weekly farm stand using their EBT dollars (also known as SNAP, Basic Food or Food Stamps). In addition, EBT cardholders can get a dollar-for-dollar match through the Fresh Bucks program. We began the application process last fall, but had a challenging time moving forward largely due our unique model. We’re not a farmers market. We’re not the farmers. We’re a mobile farm stand operated by a nonprofit that buys wholesale from local growers to then sell directly to the community. This all made it challenging to check of the necessary boxes in the application and submit. However, thanks to the dedication of many partners, we were able to get clear guidance from USDA’s Food Nutrition Services (FNS), the federal agency that manages EBT retailer authorization. We would like to extend a BIG thank you to partners that helped us through the application process. FIN and IRC’s New Roots Program received support from King County Public Health, WSU SNAP-Ed and WA Farmers Market Association.